Available in 1 size 1.25hp Variable 3 Speed Motor. 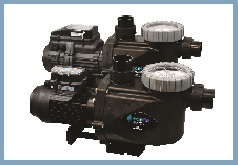 For the ultimate in energy saving, Reltech's new ECOFLO V3 PRO and V3 PRO Plus series pumps are the quiet achievers. 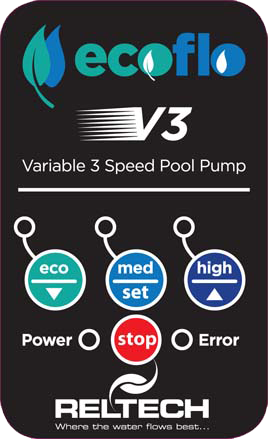 A unique blend of efficiency and ultra quiet performance, the ECOFLO V3 PRO and V3 PRO Plus can reduce your pool's electricity running costs and carbon emissions by up to 70%, without comprimising performance when you need it. Available in 1.25hp ariable 3 Speed Motor. 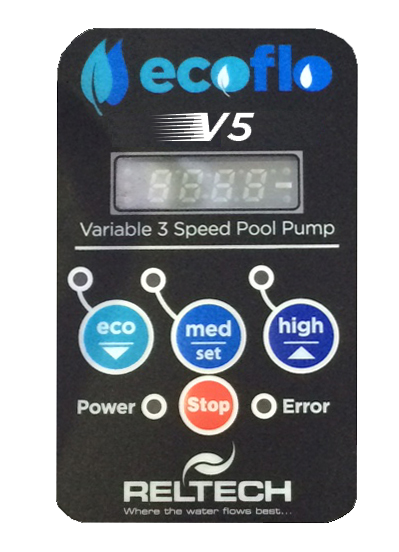 ECOFLOW V3 PRO Plus includes LED Display with RPM readout and Data Port. This allows communication with the ECOFLOW Ecommander system . Available in 1 size 1.75hp Variable 3 Speed Motor. 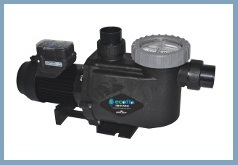 For the ultimate in energy saving, Reltech's new ECOFLO V35PRO series pump is the quiet achievers. 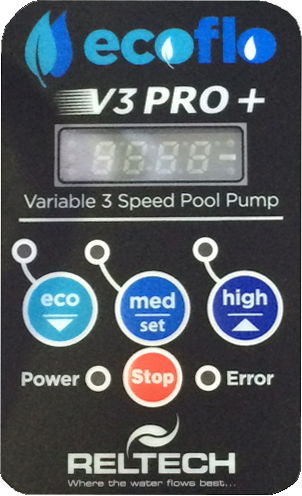 A unique blend of efficiency and ultra quiet performance, the ECOFLO V5 PRO can reduce your pool's electricity running costs and carbon emissions by up to 70%, without comprimising performance when you need it. It is a cut above the V3 series.